Composer Clint Borzoni (left) and Barihunk Marco Vassalli (right) and a peak at "Stufen"
The buzz has been building for the world premiere of the new Clint Borzoni songs for String Quartet & Baritone, which will be sung by Marco Vassalli in his official US debut on January 22 & 24 in San Francisco with Musica Marin. We've heard the music and seen the scores and can attest to their stunning beauty. We predict that these songs will become standard fare alongside Barber's Dover Beach, which is also on the program along with songs by Schubert and Richard Strauss. The Sunday matinee is selling fast (https://goo.gl/hjyBSy) and the Friday night tickets are available here (https://goo.gl/ZzSQ4N). But if you're not in Northern California there are still many ways to enjoy this amazing operatic experience. 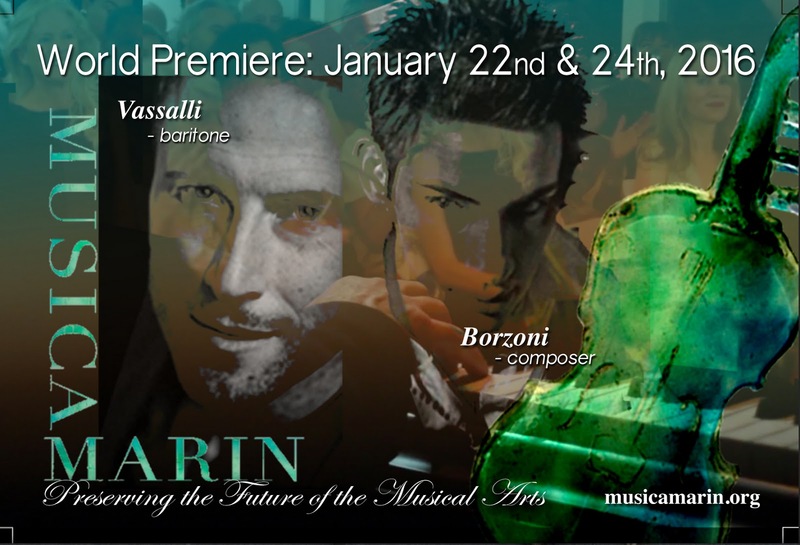 On Wednesday, December 16th you can watch the first online rehearsal of the music on Periscope (so make sure to LIKE Musica Marin on both Facebook and Twitter. The link will be available there on the day of the rehearsal). Italian-German barihunk Marco Vassalli is making his much anticipated U.S. debut with Musica Marin in with these songs, which were selected by and written for the singer. Vassalli chose Hermann Hesse's Stufen and Hilde Domin's Margere Kost. You can click HERE to the singer discuss why he chose these texts. Borzoni recently completed his fourth opera, When Adonis Calls, based on the poetry of Gavin Dillard and arranged by John de los Santos. The opera was presented at Fort Worth Opera’s 2015 Frontiers Showcase. He is currently working on his fifth opera, The Copper Queen, also with librettist John de los Santos for Arizona Opera’s program, Arizona Spark. 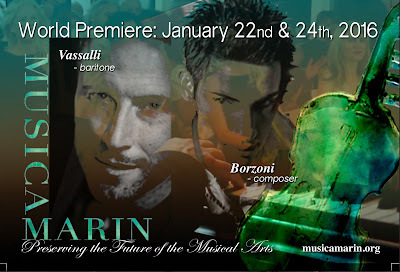 Borzoni and Vassalli have never met in person and have worked on the songs together over Facebook video and Skype. San Francisco's Bay Area Reporter broke the news in a recent article, which you can read HERE. The premiere is being funded with an Indiegogo campaign with perks that include having one of the songs dedicated to you, a signed page from the composer's notebook, copies of Vassalli's CD of Italian songs and access to numerous private events and concerts. Additional funding is coming from a provocative new calendar which Vassalli posed for and is available for sale HERE. Vassalli is currently performing in Leonard Bernstein's Candide at the Staatsoper Hannover. 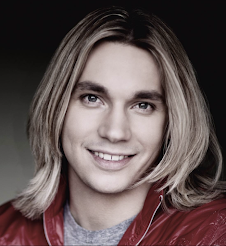 A German singer born of Italian roots, he grew up on Lake Constance and began his studies at the Hochschule fur Musik in Cologne, where he studied with the famed soprano Edda Moser.